Right this instant, Detroiters could be visiting what is surely the only pop-up restaurant that is an ode to a food someone threw up. Eminem, in a poorly named attempt to promote his new album Revival, is this weekend hosting a Mom’s Spaghetti pop-up restaurant and shop at music venue The Shelter—the very venue where said vomiting would have occurred. Meta. 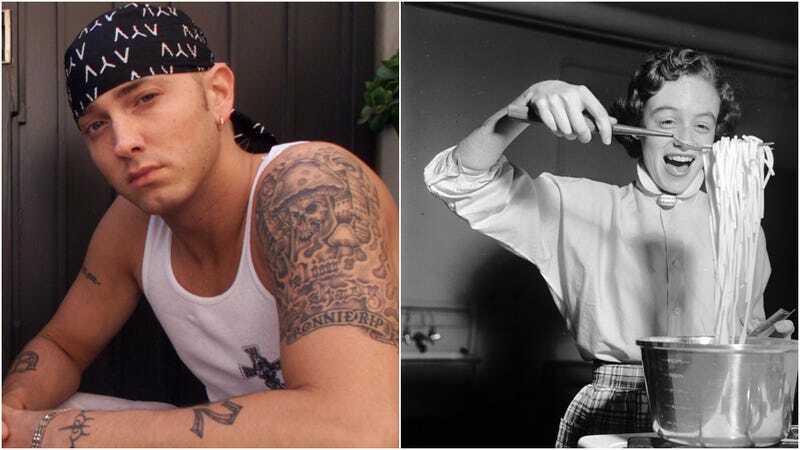 According to promoters, the pop-up serves dishes inspired by Eminem’s role in 8 Mile, a film that marked its 15th anniversary last month my god we’re so old. The shop will also sell Revival merchandise, but who cares, tell us more about puke spaghetti. “It’s not the kind of pasta you’d expect if your grandma came from Italy on a boat. It’s more like the spaghetti you’d know if your mom came to Michigan on a bus,” says Curt Catallo, co-owner of Union Joints, the restaurant group that partnered with Shady for the pop-up. The spaghetti is served with made-from-scratch sauce, jarred Parmesan cheese, garlic bread, and can be ordered with optional meatballs. In a dish inspired by Eminem’s “real-life upbringing,” the menu also offers a grilled (what?) Spaghetti Sandwich on white bread. Intrigued? The pop-up is open from 10 a.m. to 5 p.m. Friday and Saturday, and noon to 5 p.m. Sunday.